Unwind as you stretch on the Mayfair Memory Foam & Orthopaedic Sprung 5ft King Size Zip & Link Bed. The superb memory foam allows you to sink slowly into the mattress, giving an unforgettable night's sleep. It is perfect for anyone seeking a firm mattress with the all the benefits of memory foam. The Mayfair is an elegant orthopaedic memory bed which will ensure many restful nights. The mattress features layers of soft, high quality hypoallergenic fillings and includes a two inch memory foam topper. It is available with a Platform top Base, and is made from solid timber to provide a comfortable, sturdy, sleeping platform. It is upholstered with a luxury White Damask fabric. it comes with easy glide castors and attachments for the headboard. The base comes in two sections with castors and attachments for the headboard. The Height of the platform top divan base is 14ins. You will receive delivery for 2 x 2ft 6in single complete zip linked divan beds including two mattresses. 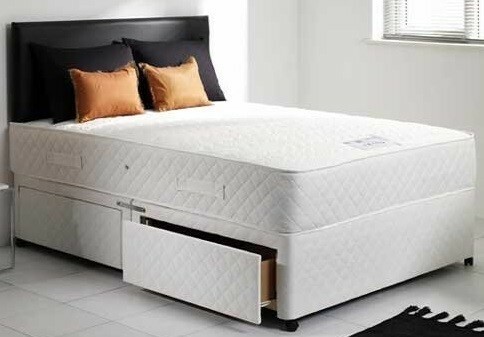 This king size zip and link divan bed is 5ft wide and 6ft 3in long and can be unzipped into two x 2ft 6in wide single beds. Each mattress has a reinforced zip to join together. You can use them as two separate single beds or they can be used as one bed by joining them together by zips and linking bars provided with the bed.